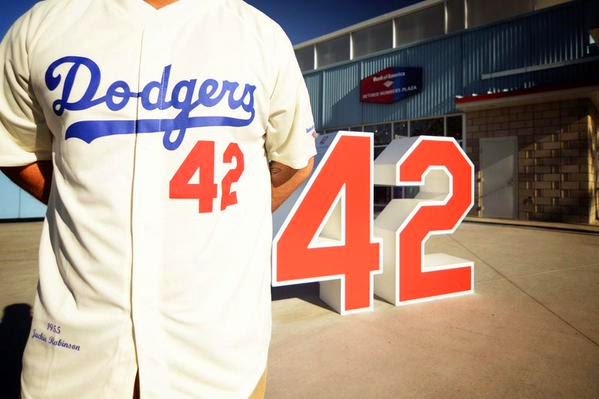 SO CAL SPECIAL: The Dodgers return to Southern California tonight with the first of three exhibition games against the Angels, before the season begins on Monday, April 6, against the Padres at Dodger Stadium. Tomorrow night, the squads will be back at Angel Stadium and then close out the Freeway Series at Dodger Stadium Saturday at 6:10 p.m. The clubs will face off six times during the regular season, July 31-Aug. 2 at Dodger Stadium and Sept. 7-9 at Angel Stadium. Last year, the Dodgers won the season series between the clubs, 3-1, their first victory in the season series since 2006 (4-2). In anticipation of the Freeway Series, the clubs partnered on a billboard in Hollywood to celebrate the 2014 Most Valuable Player Awards of Clayton Kershaw and Mike Trout, with the script “Is Your MVP Red Or Blue.” Fans are encouraged to show their support by utilizing the hashtags #MVPKersh and #MVPTrout. On this date in 1962, the Dodgers and Angels played their first-ever game against each other with the Halos coming out on top, 6-5. Los Angeles has the National League’s top winning percentage this spring at .640 (16-9-7) and has established a new franchise record with seven ties. The Dodgers will have a bullpen game tonight with the starter still undecided. Those expected to see action include Mike Adams and Sergio Santos. Opening Day is just FOUR days away! PADDING THE RECORD: The Dodgers allowed two runs to the Royals in the bottom of the ninth yesterday and ended up in a record-setting seventh tie this spring, 4-4. 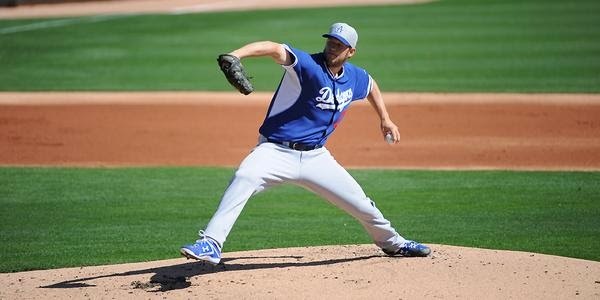 The contest in Surprise was the club’s last Cactus League game in Arizona and the final tuneup for NL MVP Clayton Kershaw, who allowed one unearned run in 3.0 innings. Kershaw posted a 1.61 ERA this spring, picking up right where he left off in the 2014 campaign, when he produced the lowest ERA (1.77) since Pedro Martinez’s 1.74 in 2000. Following Kershaw to the mound was Zach Lee, who allowed three runs in 5.1 innings and finished the spring with a 2.89 ERA. At he plate, Darwin Barney went 2-for-2 with a run scored, A.J. Ellis doubled and drove in a run and minor leaguer Travis Witherspoon went 2-for-2 with a home run. A PLEASANT GOOD AFTERNOON: The Dodgers and the Los Angeles Police Department are spreading the word that fans should not park on the Avenue of the Palms (Stadium Way) between Scott Road and Academy Road. This street will have a “No Parking” restriction from 5 a.m. to 5 p.m. on Opening Day, April 6. In addition, in order to keep all attendees safe, LAPD officers will be patrolling the area and will enact a zero tolerance policy for drinking in public or in the parks. Tailgating is not permitted on the Dodger Stadium premises. 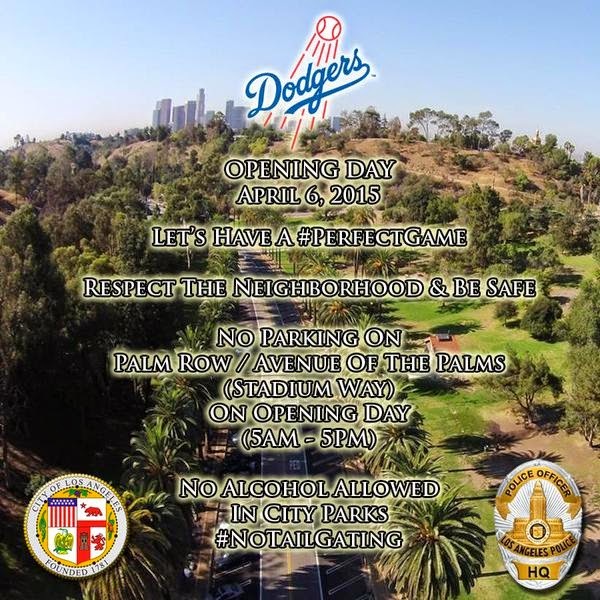 The Dodgers and the LAPD wish everyone a safe and fun-filled day of baseball, and ask fans to respect the neighborhood and stay safe. I had previously written about some of the specific restrictions being put into place here. Many of the neighborhood streets in the Echo Park and Solano Canyon area will have 2-hour parking restrictions. SAFETY FIRST: Dodger fans will experience new security procedures set forth by Major League Baseball beginning with the Freeway Series finale on Saturday, April 4 with the Angels and running through the 2015 MLB season. MLB will be implementing new mandatory security procedures through a metal detector-enhanced screening process. This procedure, which resulted from a recent study of best security practices and MLB’s continuing work with the Department of Homeland Security to elevate and standardize initiatives across the game, will be in addition to bag checks that have been uniform throughout MLB. Fan screening may be conducted by means of hand-held metal detection or walk-through magnetometers. These procedures were utilized periodically at certain gates during the 2014 season and all 30 Major League Baseball teams will institute these procedures this year. FOLLOW THE CACTUS LEADERS: The Dodgers have blasted a Major League lead-tying 47 home runs (the Cubs also have 47) and have a .286 team batting average (3rd, NL) with a .488 slugging percentage (1st, NL) this spring. 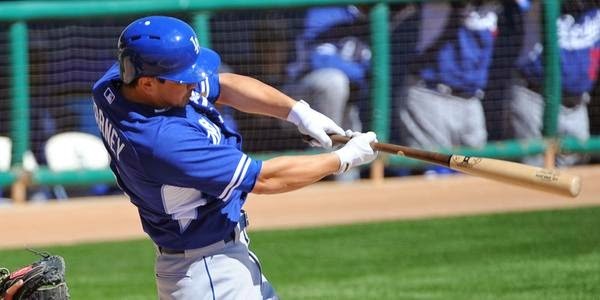 Joc Pederson continues to rank among the NL leaders this spring in batting average (.368, 5th), slugging percentage (.754, 1st), hits (21, T-8th), runs (13, T-3rd), total bases (43, 2nd) and home runs (6, T-2nd). Justin Turner has hit safely in 15 of his last 16 games and is batting .477 with six doubles, three homers and eight RBI, while posting a .500 on-base percentage and a .818 slugging percentage in 18 Cactus League games. Yasiel Puig ranks among the NL’s best this spring in home runs (5, T-4th) while Kiké Hernandez places among the league’s best in home runs (5, T-4th) and runs scored (12, T-7th). THE BIG 7-0: The Dodgers would like to wish a very happy birthday to Hall of Famer Don Sutton, who turns 70 years old today. Joining Sutton in celebrating his birthday is legendary Dodger slugger Reggie Smith, who also turns 70. Happy Birthday guys!